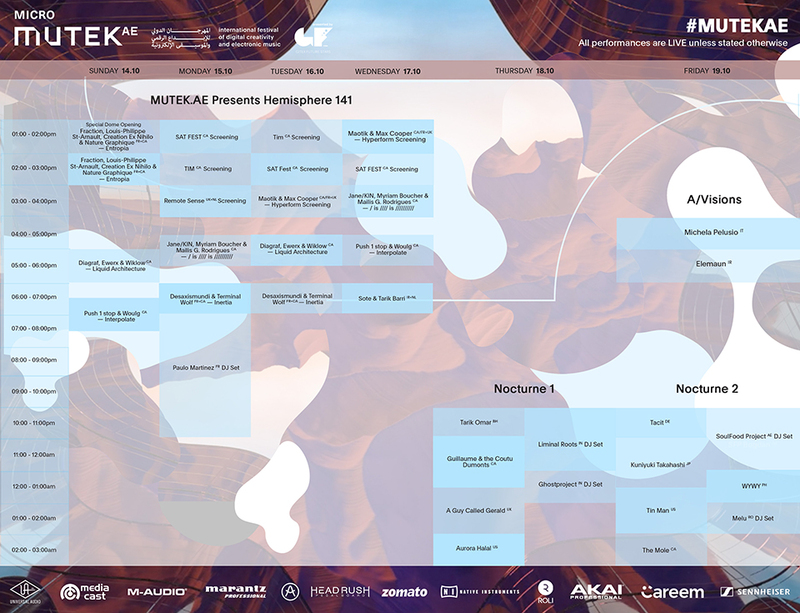 MICRO MUTEK.AE is known for breaking new ground both sonically and visually within the Middle East contemporary music scene. MICRO MUTEK.AE presented by GITEX Future Stars is proud to unveil another exhilarating adventure in contemporary electronic and digital arts. The second edition will feature an eclectically curated line up of some of the most visionary and original artists in the electronic music and visual/tech world. Spread across four venues in Dubai, the first wave of programming, MICRO MUTEK.AE presents Hemisphere 141 takes place on 14-17 October at Dubai World Trade Centre (DWTC). The 360° immersive live performances in collaboration with the Society for Arts and Technology (SAT) from Montréal were created within its residency art creation program. Shown as part of the world tour SAT Circuit, they will take centre stage within a tri-dimensional and high definition dome, guaranteeing a transformational experience. Hemisphere 141 wraps up on 17 October with a special evening performance by Sote & Tarik Barri (IR/NL). Running parallel to Hemisphere 141 at the Dubai World Trade Centre is Digi Lab, where the Legendary Electronic music producer, A Guy Called Gerald (UK) will be hosting workshops. In partnership with Media Cast, this is a chance for the industry to get their hands on the future of music production technology, with the latest electronic music instruments on offer. Entry to Hemisphere 141 and Digi Lab is free of charge by registering at gitexfuturestars.com. Nocturne 1 & 2 take place on 18 - 19 October at Stereo Arcade, presenting an altogether different slant on club events. The night time programming will offer live performances and immersive musical experiences seldom found elsewhere, but of course this is the very essence of MICRO MUTEK.AE. Tickets to be released on platinumlist.net soon. A/Visions on 19 October at Dubai Knowledge Park’s Amphitheatre see’s Michela Pelusio (IT) take to the stage with her signature immersive audiovisual experiences that use space, light, matter and sound, to create the sensation of being present in an environment of magic. Last year’s festival brought an unimaginable line-up of cutting edge local and international artists in music, audio visual and technology such as the regional debut of the highly influential drum machine wizard and Underground Resistance founder - Jeff Mills, Dasha Rush and Habibi Funk. The 2018 line up will feature a sophisticated selection of the world’s most avant-garde live audio-visual artists, to be announced soon.